Digger by Ursula Vernon » Archive » Good News, Everyone! Digger vol. Four will be available for order July 10th! Copies will hopefully be available at Anthrocon if you’re going to be there (I’ll be there, signing and selling art) so check it out! Hi Ursula! Congratulations of the books! I’m really looking forward to Digger Vol. 4 and Dragonbreath! A quick question though! Will signed copies of Digger Vol. 4 be available on Sofa Wolf as they have in the past? I am super happy to hear that digger vol 4 is coming out. Are you planning to come to San Diego for comic con? Or Ape? Joelle–excellent chance they will be, yup! *does the happy computer chair dance* YAY! Will you be at AC to sign them? Dude, I saw Dragonbreath in Wal-Mart yesterday, and my cousin was like “Whaaaah?”, but I thought it was awesome. Sofawolf seems to be broken. 🙁 I can’t access their catalog at all. I came in while Digger was on Graphicsmash, in the middle of the funeral. I’m SO glad to have finally been able to read the whole archive free–but now I want hardcopy to keep. 🙂 This is excellent stuff, and thank you for it! I read that post in Professor Farnsworth’s voice. OMG, I didn’t connect Dragonbreath with Digger. D’oh! I reviewed Dragonbreath for Booklist (review will appear soon if not already). I had purchased Digger Vol. 1 through Diamond Previews at my LCS some time back, and only this past week sat down and read it. Why didn’t I connect the name? Oh well. I’ll be looking for more Digger, that’s for sure. And Dragonbreath – well, it may not be kosher for the reviewer to say anything before the review is published. 😉 – but thanks for writing it! Oh yay, I can continue my tradition of getting a wombat in my book every year! I’ve been reading Nurk and more recently Dragonbreath to my four-year-old for a couple months now. She loves ’em, and I think they’re great too. If you ever have misgivings about giving Digger away for free online, rest assured it’s sold at least a few other books :). Oooh. Book FOUR!! I’m so buying that. Any chance we could ever potentially get a Digger T-shirt? Because that would also be awesomness! On one computer I can see a link to Amazon. On the other, only the banner that is on top of that link. The first is using the latest Firefox and has a few more addons. Both have NoScript an Adblock Plus. The second is a LInux machine and does not have the latest firefox. Please consider updating so more can order your stuff. 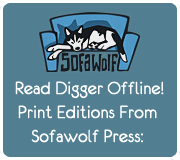 My xmas list went out w/o a link to a site where I could send people to buy Digger.